Hall, Russell and Co, and Alexander Hall and Co were two famous Aberdeen shipbuilders with yards next to each other. The Hall Russell Yard was nationalised in July 1977, becoming part of British Shipbuilders Corporation, and then was dedicated to naval work. This was undertaken for British, and Hong Kong governments. Alexander Hall and his son William had been operating under the Alexander Hall and Company name making China tea clippers and Australian grain and wall barques. 1864 Hall, Russell and Company was founded by William and James Hall, two brothers, who joined with Glasgow engineer Thomas Russell and took over the foundry of the Aberdeen Iron Works. The initial aim was to make marine engines and then open a shipyard. They achieved this in a very short time with the first ship being built three years later. 1880s In the mid 1880s, steel replaced iron. 1897 Private company. The company became a limited liability one in 1897. Also at this time the yard made the first of a series of fourteen large steamers for John T. Rennie and Co.
1880 The yard also engined the first steam trawler built at Aberdeen in 1880: North Star. This was the first of hundreds. In the 1900s the company continued making trawlers, cruisers, coasters, colliers. 1904 the company took limited liability status and concentrated on trawlers, drifters, and small coasters. It also made a number of ships for the Admiralty. WWI During the First World War the yard’s main output was Admiralty ordered trawlers and drifters as well as other local fleets of the Aberdeen Steam Trawling and Fishing Co. After the War, the yard made coasters, trawlers, and ferries. In the 1920s the yard received orders for large Transatlantic traders and was the first of many such large ships. 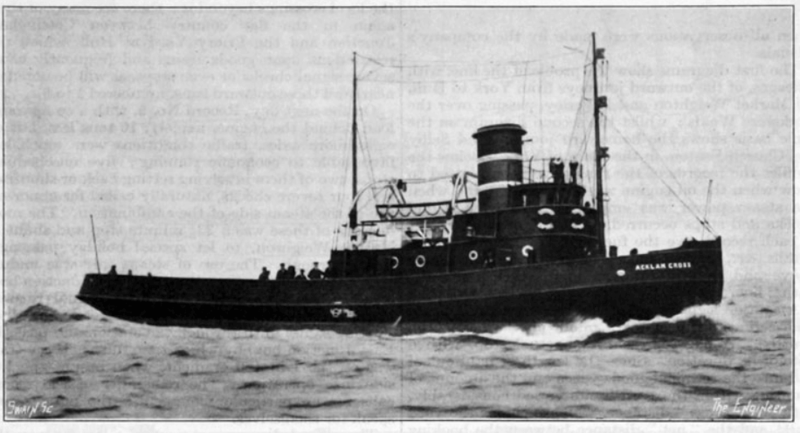 The yard continued making colliers, trawlers and tugs, including the firs ever diesel-electric tug in the world. WWII Output was frigates, corvettes, minesweepers, tank landing craft, coastal salvage vessels and other small naval craft along with many trawlers and tugs. 1942 the yard was taken over by the Burntisland Shipbuilding Co and was joined in 1953 by Alexander Hall and Co to form the Burntisland Shipbuilding Co.
From 1949 to 1969 the yard made over 32 large colliers and general cargo ships. From 1955 onwards the yard went from strength to strength with a full order book for medium-sized sugar carriers and mini bulkers along with smaller passenger cargo ships. 1960s The National Environment Research Council placed an order for an oceanographic survey ship which was completed as Discovery. More trawlers and research fishing vessels then followed throughout the 60s. 1968 the Burntisland Shipbuilding Group was liquidated but the yard continued making ferries, roll on/roll off ships. Later, a series of coastal and deep sea tankers were made along with coasters and Mediterranean traders. 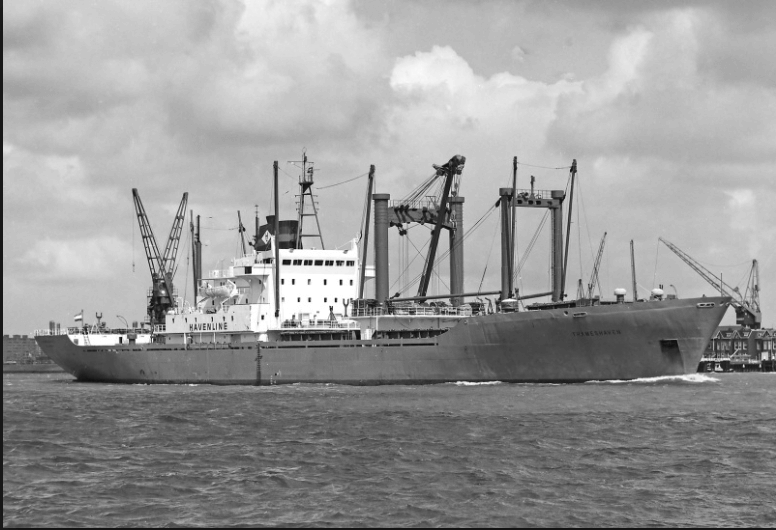 1971 Hall Russell delivered the largest ship ever built in Aberdeen, the 10,500 tons deadweight cargo vessel Thameshaven, for a Rotterdam owner. 1970s In the 70s a number of off-shore patrol vessels were made for the Royal Navy, along with torpedo recovery ships. 1977 The Hall Russell Yard was nationalised in July 1977, becoming part of British Shipbuilders Corporation, and then was dedicated to naval work. This was undertaken for British, and Hong Kong governments. 1982 The firm began shipbuilding indoors as opposed to outside. Workers at the Aberdeen yard began working indoors from mid-September this year under a £2 million building hall that covered the two main building berths. The idea behind the scheme was to improve productivity. The hall measured 121 x 46 metres and could take ships up to 8000 tonne dead-weight. In 1986 the yard was privatised and a £19M passenger/cargo liner was ordered by St Helena Government. 1988 The yard ran into financial difficulties in 1988 and receivers were called in. 1989 The yard was sold privately to A. and P. Appledore (Aberdeen). 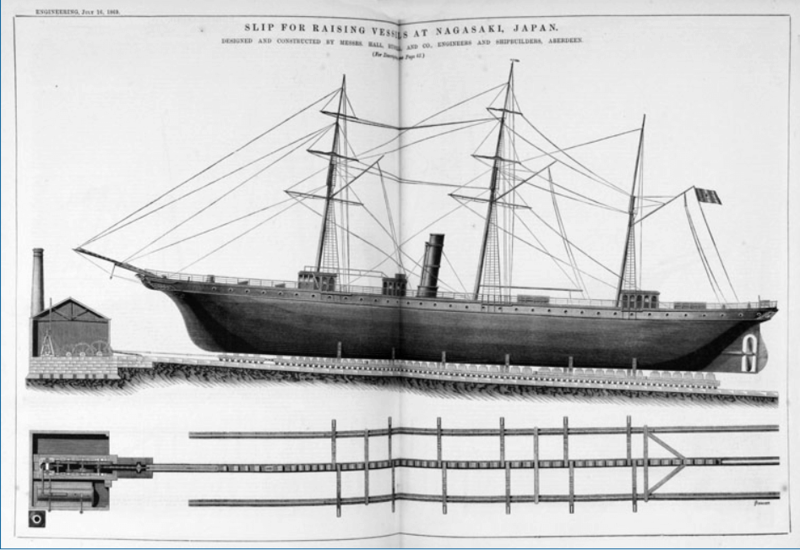 One more ship was completed at the yard which then concentrated on ship repair work. This article was first posted on 5th June 2018.